Lock down your propane tanks to keep them safe and secure on your Airstream trailer. This specially designed lock attaches to the 1/2" threaded rod that is positioned in the middle of your dual propane tank setup. 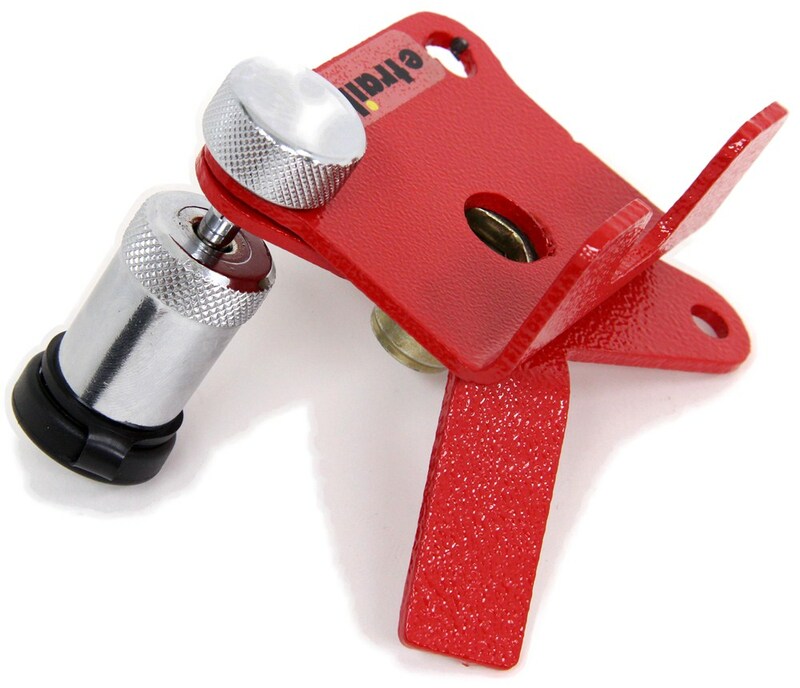 Lowest Prices for the best rv locks from TorkLift. TorkLift Fortress GasLock Kit for Propane Tanks with 1/2" Threaded Rod on Airstream Trailers part number TLA7770 can be ordered online at etrailer.com or call 800-298-8924 for expert service. Lock down your propane tanks to keep them safe and secure on your Airstream trailer. This specially designed lock attaches to the 1/2" threaded rod that is positioned in the middle of your dual propane tank setup. 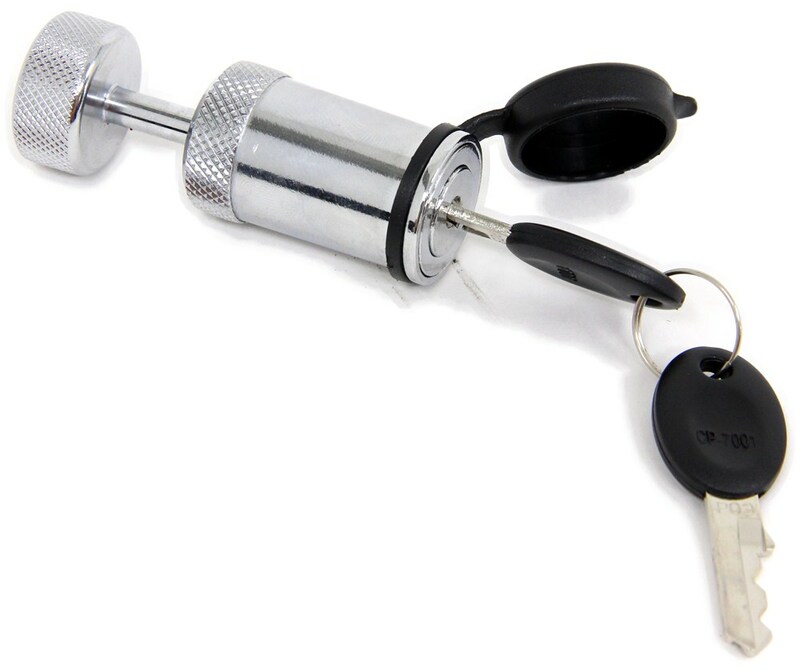 Replaces the 7/8" long cam lock cylinder found on your RV's baggage door or other locking storage compartment door. 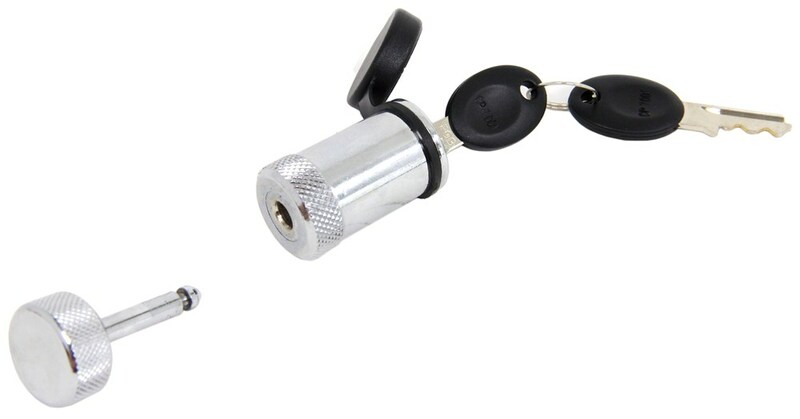 This cam lock can be keyed alike to match your other Global Link RV locks. Includes 1 key. Keep your RV's interior off-limits with a new entry door lock. It replaces your original Global Link, Bauer, Lippert Components, Fastec (FIC), or TriMark standard entry door lock. The lock can be keyed alike to match other Global Link locks. Lock down your propane tanks to keep them safe and secure on your trailer or RV. This specially designed lock attaches to the 3/8" threaded rod that is positioned in the middle of your dual propane tank setup. Randy: Hey guys. Randy here at etrailer.com. Today we're taking a look at a new product from Torque Lift. It's the Fortress gas lot. This is going to give us an excellent solution that we really haven't had in the past. 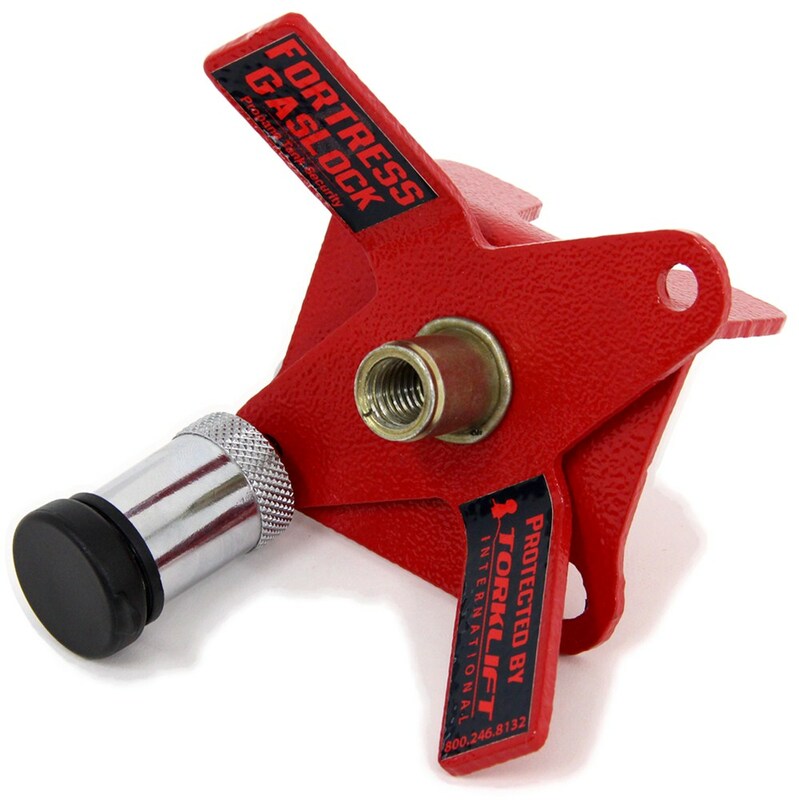 This allows us to lock two propane tanks down to the front of our camper or RV, and prevent them from being removed. Now, not only does it secure our tanks as you can see, but also our regulator, and also our hoses. So we're not going to have to worry about all of those pieces disappearing causing us a very expensive replacement. Whether you've got the half inch, or three eighths inch threaded rod, we're going to have a solution for you. It's going to have a heavy powder coat finish on it, and it is lightweight. It's made out of military grade aluminum. So we're not going to really have to worry about any corrosion, or any issues like that. Also, going to have our lock right here. Nice heavy duty lock. Pull that off and see we've got our cap open there.That'll allow us to slide our key in there, lock and unlock that, and then back this off if we want to get our tanks off to take them and have them filled or whatever we might need to do. Now to install our Fortress lock, we'll need to remove the old style wing nut. Just going to loosen that up and set it aside. Then we can bring our Fortress lock right down and over. I'm going to position this tab rearward. Since our regulator is right here, I want to have enough room for my lock. Now we'll take that stainless washer. We want to place that down on. Then we can get that threaded down and on. Now, we're going attention this just like we would our normal keeper here. We just need to ensure either this tab or this tab lines up with the tab on that lower section, so we can get our lock through.So right there looks good. Then we can place the lock through. We have the option of placing it either way we want. I do recommend though that we put this rubber spacer on the top side. We can put our lock on this way. But as that goes down the road, that'll kind of keep it from rattling. We won't hear that metal noise as it bounces up and down. We just put our cap on. But at that point, everything's going to be nice and secure and we won't have to worry about anybody getting away with our tanks. That's going to complete our look at the Fortress gas lock from Torque Lift. 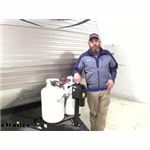 Order: RelevanceNewestRating - High to LowRating - Low to High Lock down your propane tanks to keep them safe and secure on your Airstream trailer. This specially designed lock attaches to the 1/2" threaded rod that is positioned in the middle of your dual propane tank setup. It works great. Still the only problem is that the lock has to be turned upside down for the lid to close on propane tanks. Not a big problem but should be corrected by new generation of the lock. I am still as pleased with this product as I was a year ago. Still going strong! Im very glad I made this purchase...no more stolen tanks! If the rod is threaded on both ends, take the bar apart and two nuts underneath the tank holder bar so no one can unscrew from the bottom. I found that you can get a pair of pliers on the rod and remove it from the bottm as the hole thing will come right out. Still seems like a very good buy! Thank you for your review. This Torklift Gaslock kit part #TLA7701 is not made for airstream trailers. 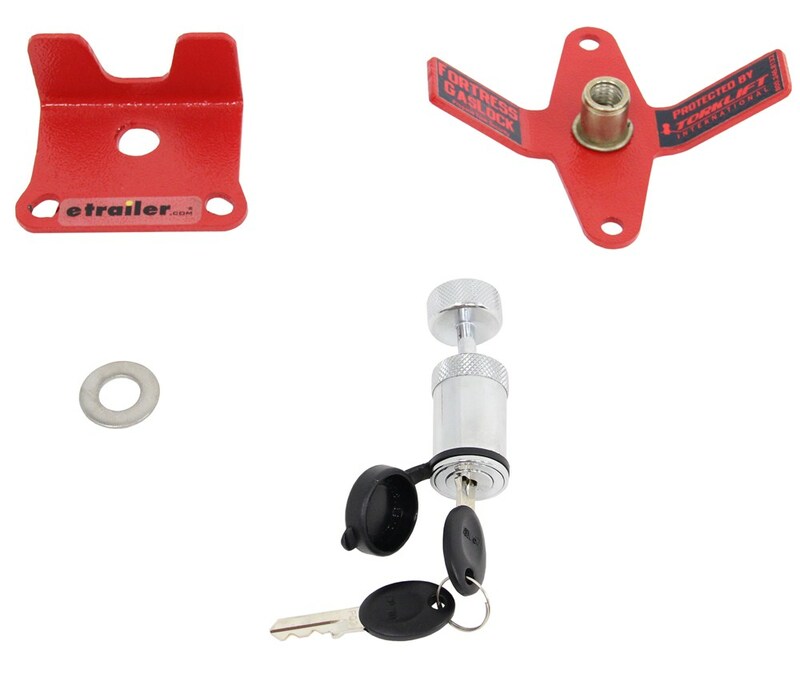 The lock kits designed for Airstream trailer are part #TLA7771 that attaches to a 3/8 threaded rod on the propane tank setup and part #TLA7770 that attaches to a 1/2 threaded rod on the propane tank setup. Do you have a question about this RV Lock? Highest quality rv locks for the best price. Most detailed, accurate rv lock information available.